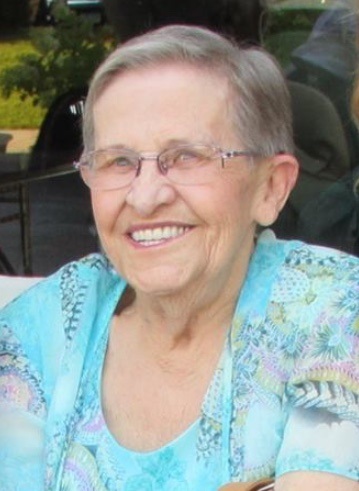 Florence Braun, 87, passed away peacefully holding her daughter’s hand on Thursday, January 11, 2018 in Mesa, AZ. She was born October 1930 in ND to Joseph and Francis Meyer. In 1951 she married the love of her life, Alvin J Braun. They were lucky to have celebrated over 46 years together before his passing in 1998. Most of their married life raising children was spent in Minot, ND. After retirement in 1986, they moved to Mesa, AZ to enjoy some warm weather. She loved to cook, play bridge, golf, and play tennis. Florence’s greatest accomplishment of which she took the most pride was raising their four children. Braun, and twin daughters, Becky (Ron) Kresel, and Brenda Wilkens. Her legacy will be continued through her 13 grandchildren and 25 great-grandchldren. Florence is also survived by her sister, Bernice Warren, brother Art (Marlene) Meyer, and sister Arlene (Arnold) Mollendorf. Florence is preceded in death by her husband, Alvin J Braun, her infant daughter, Beth Ann, her parents, and three sisters. Funeral Services for Florence will be held Friday, January 19, 2018 at 11:00 AM at Holy Cross Catholic Church, 1244 S Power Road, Mesa, AZ 85206. We truly enjoyed the time we had with Florence here. We will all miss her sweet smile and warm friendship at the community. Brenda – We are So sorry to hear of the loss of your mother. Our prayers are with you and your family. Your mom has slipped through the bonds of this earth to go to another place where she can reunite with love ones who have gone before. Blessings to you and your family. So Sorry for the loss of your mother. Our prayers are with your family at this time.